Why do you need a content delivery network (CDN) in your blog or why to use CDN? Get the answer by reading this full post. I never thought that one day I will integrate CDN in my blog because at initial days I have no idea about what a Content Delivery Network is and how it can improve the performance of my blog. Gradually, when my blog started getting a decent amount of traffic I started facing different problems such as spamming bots were polluting my blog with unnecessary comments and on the other hand, they are also using the resources of my web hosting services which is also affecting the speed of my blog. On one hand, my blog traffic was booming day by day on the other hand my blog was also the target of hackers and spamming bots. Each day when I used to see my stats there used to be hundreds of suspicious login attempts and spam comments in the spam folder. Not only the hackers and bots are the problem for a blog, its speed also matters a lot in terms of SEO. Even though you may have created a well optimized high quality content, you cannot rank until the speed of your blog is not optimized or is slower than your competitors blog. How to add CDN in your website? 2.1. How cloudflare CDN can protect your site? Why I am writing all these stuffs is because after using CDN you can freak out from all these situation and you can even improve your website speed. CDN helps to prevent spammers and crawling bots from entering your site to protect your blog from spam comments and from attacks such as brute force. I think it’s enough now, I am coming to the point. So, the point is why to use cdn in a blog. For more clarity and to be more descriptive here I have mentioned 5 reasons to use a content delivery network in your blog. Before learning anything let’s learn what a content delivery network (CDN) is? A content delivery network is a globally distributed network of server which helps you to optimize the speed and helps to block the threats and spammers from visiting your website. In simple words a CDN is a collection of distributed servers located in different locations of the world. Whenever a visitor visits a website a CDN delivers the cached content from the nearest location to increase the speed your website. For example Currently, ITDigitalWorld is hosted on a server located in the United States and most of the visitors are from India, Pakistan and from United states. Therefore, it will load faster if the visitors are from United states because server is located near to them, but the speed will significantly goes on decreasing if distance between the web server and the visitor increases. So, it will load slower if the visitor are from India or Pakistan. I have used Cloudflare CDN to overcome this issue because it has over 30 distributed server around the world and therefore whenever there is a visitors from south asian countries the cdn serves the cached copy of my website from nearest web server i.e. from the server located at Singapore. Above I have mentioned a brief introduction of CDN now its time to learn its integration process. Although there are different paid CDN available in the market but here we will use cloudflare cdn because it is absolutely free. Guys let’s get started with a free plan offered by cloud flare CDN. Step 2: Click on sign up located at top right corner and after filling the required details click on create account now. Step 3: The next step is to add your website in cloudflare, Just enter your domain name in the box. Step 4: Now, after adding your website you will get the name servers from cloudflare, just change your name server from your domain control panel to the name server provided by cloudflare. It’s over now your website is properly configured, now your traffic is passing through cloudflare’s network. Above I have described the process to add CDN and now it’s time to explain the reasons why to use cdn. No matter how fast your web server is, it is impossible to maintain same speed if the distance between and web server and visitor increases. As I have already mentioned that my web hosting server is located in US and therefore my website will run faster if the visitor is from US but the speed gradually goes on decreasing if the visitor is from another country. So, a CDN solves this issue just by distributing your contents are the world. Let’s take a real-time example of cloudflare CDN which is the best and absolutely free content delivery network. 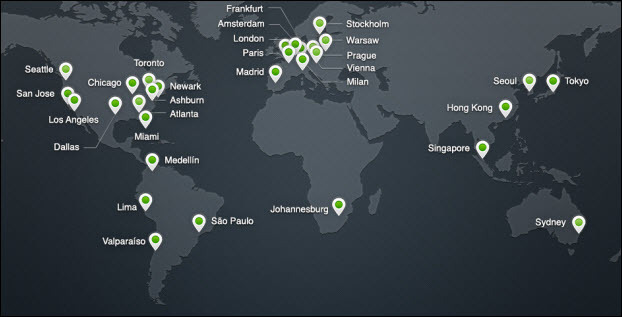 Cloudflare has the large collection of 30 distributed servers around the world, you can can find the locations in the above picture. Therefore whenever a visitor comes from India or pakistan it will serve a cached page from the nearest server and this will obviously decrease the request time and will help to increase the speed of your website. As I am using Cloudflare CDN because it’s free and I will be talking about its feature of preventing bots and attack . Cloudflare blocks all types of threats like comment spam and excessive bots crawling to malicious attacks like SQL injection and Denial of Service (DOS) attacks. There specially designed algorithm automatically detects the new attacks and protect against all these types of threats to keep your website safe. As I have already mentioned that Cloudflare can automatically detects new attacks therefore once it identifies that there is a new attack it starts its security procedure by blocking the attacks from both the particular website and the entire cloudflare community. One of the great feature of Cloudflare CDN is that it shows the list of threats that have been stopped from reaching your website and you can sort them by country origin, threat type and severity. A cloudflare CDN can protect you site from various threats like cross site scripting, SQL injection, Comment spam, excessive bot crawling, email harvester, and more. Cloudflare uses advance technology to collect threat data from variety of sources to build a reputation for every online visitor. The easy customization option in cloudflare allows you to setup a desired security setting for your site and then it’s network stops the threats before it reaches to your website. Similarly, in addition to cloudflare automatic detection, you can easily add the list of ip address, ip ranges or the entire country to your trust or block list. I have seen many bloggers using limited hosting plans, with limited amount of monthly bandwidth. At initial days it will be fine but gradually when the blog gets popularity and starts getting organic visits then it will obviously be headache for blogger using hosting plan with limited amount of transfer rate. Yes, it is fine.You can tolerate the situation when all of your monthly transfer rate is consumed by your genuine readers but what if your monthly bandwidth is wasted over spamming bots. Even though spamming bots are not your genuine readers but logically they are consuming the bandwidth of your server and therefore you need to take a proper action to block such spamming bots from consuming your server memory. To save the bandwidth and resources a CDN lies between the web hosting server and the visitor therefore whenever any traffic arrives at your site it is analyzed and threats are blocked before they get to your website. Sometime you may face a situation when you want to change your web hosting provider and therefore in order to change your provider you will need to upload your backup files to new hosting provider. Uploading your backup file is not a complete process to migrate your site. I think you probably know that you need to change your name server in your domain name to point towards another web hosting provider. The domain may take around 24 hours to point towards another hosting provider but if you site is intregated with CDN, you can point your domain name just by changing the ip address in few clicks. Cloudflare has around 30 distributed server around the world therefore whenever you make any changes to your website it will automatically make a cached copy of your website and after creating a cached copy it will distribute that content to all of its server located in different locations. Now your contents have more than 30 copies stored in different locations and whenever visitor access to your site the contents are delivered through the nearest location. I think you have learnt adequate answer for why to use cdn. I have been using cloudflare CDN since 1 year because you don’t need to pay a single penny until you don’t want any extra features. I don’t think you need to buy a paid plan of cloudflare for your website because its free plan is good enough to take care of your website. Now, guys its time to boost your speed just sign up for cloudflare and protect your website from bots and threats. Guys, if you love this post please share it with your friends and if have any queries or suggestion regarding a CDN then please comment below to share your experience. Thank you for your info. Yes, on my opinion, to use a CDN is very useful to make a website faster, secured and even seo-optimized. Personally i’d definitely recommend Edgecast CDN services for serious websites. This network is one of the leaders of the industry and even such a big names like WordPress and Twitter have chosen them. Though for a regular website they are also ready to offer their services and the website undoubtedly will work as fast as possible. And also will be secured and well-optimized. There are a number of their resellers that offer no annual contracts and very affordable prices for those services. Check out Jodihost.com, for example.